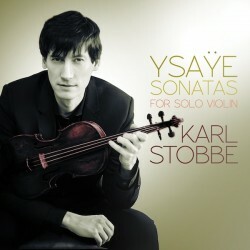 Canadian violinist Karl Stobbe makes an indelible mark with his debut recording for AVIE, a bold traversal of Ysaÿe’s Six Sonatas for Solo Violin. Seminal works of the 20th century, Ysaÿe – a virtuoso violinist himself – was inspired by J. S. Bach’s works for solo violin, and remarked, “at the present day the tools of violin mastery, of expression, technique, mechanism, are far more necessary than in days gone by. In fact they are indispensable, if the spirit is to express itself without restraint.” Stobbe handles Ysaÿe’s extended characterisitics and virtuoso techniques with aplomb, embuing the Sonatas with the highest musical values as well. Karl Stobbe is recognised as one of Canada’s most accomplished and diverse violinists. Whether as a concertmaster, soloist, chamber musician, or teacher, Karl is known for his dedication to excellence on the violin and classical music in all its forms. He has appeared in North America’s most notable concert halls, including Carnegie Hall, Boston’s Jordan Hall, the National Arts Centre in Ottawa, Roy Thompson Hall in Toronto and Segerstrom Hall in Costa Mesa, California. As a chamber musician and soloist, Karl has shared the stage with many leading and diverse violinists of our day, from James Ehnes to Mark O’Connor. Also an accomplished luthier, Karl’s passion for the construction and mechanics of the violin contributes to his utmost ability as a performer.